Goal for today: Use Briefcase to structure SEO Context keywords around the main keyword from your Focus Page. Optimize the Focus Page to at least 30% for the secondary (SEO Context) keywords you select. See the SEO Live Assistant to add the SEO Context keywords to your Focus Page. If I were to write about “tires”, people could think that I’m writing about a certain product or a certain activity (see? already two different things) that tires you out. That’s what people could think. That’s what Google’s algorithm could think, because it imitates the way human beings process data. That’s what allows it to give amazing results on SERPs. However, my page was about tires. Confusing? Yes, it is! To remove the confusion I would naturally tell you that I’m talking about car tires, or tires for Mazda RX-8, or tires for a Kawasaki Ninja motorcycle. Then, going around this, I could let you know that we have tires for snowy roads, tires for driving across a frozen lake (you wouldn’t believe the number of people interested in this), etc. All of these other words provide Context. That’s what SEO Context is all about. You can read about this here. It will teach you how to think about SEO Context, to help Google see that your page is really valuable for the industry (the niche) and the people whom you are targeting. You’ll find the theory and screenshots to help you implement. Read here to learn more about the theory around this. Place the contextual SEO keywords in briefcase. Go and optimize the Focus Page, using the SEO Live Assistant from Squirrly SEO. You’ll need to optimize to at least 30% for these secondary keywords of your Focus Page. Oh, and if you’re asking: it’s not important for the SEO Context keywords to have good stats, so you don’t need to bother with choosing them as I taught you in the previous days. They’re useful for building context. At this point we don’t care about ranking for those extra keywords. That’s not within the scope of the 14 Days Journey to Better Ranking. It’s important to see how to optimize for multiple keywords. You will see that if you click on the list from your SEO Live Assistant, the current keyword analysis changes according to the last keyword you’ve clicked from Live Assistant’s briefcase. 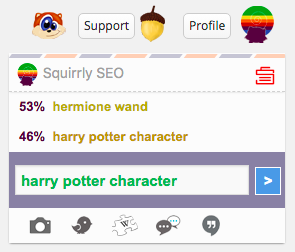 Harry Potter character is the Main Keyword of my focus page. Why? – because I’ve clicked to see the analysis and to have the Live Assistant get me to optimize my page better for this keyword. However, this is my SEO Context keyword for this case. My real keyword for the focus page. 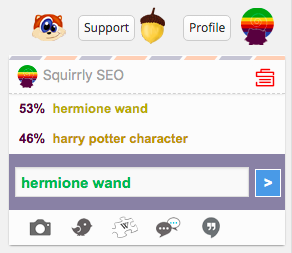 My Direct 3 keyword and my main keyword for my focus page these 14 days, is actually “hermione wand”. Please keep this in mind while performing the Day 5 recipe !!! Otherwise, you could end up seeing that the chances of ranking have gone down inside the Focus Pages section. Make sure you switch back to your Main Keyword once you’re done optimizing for the SEO Context secondary one. Otherwise, the data will be taken according to a keyword you’re not really after.